Each faction has two tokens for each of the four orders. When a player resolves an order during the Operations Phase, the system tile on which the order was placed is the active system. This section describes how players resolve each of the four orders. Purchase Units: If the player has a factory in the active system, he may purchase units and place them on any friendly or uncontrolled (not containing any units or structures) areas in the system. Purchase Structure: The player may purchase one structure and place it on any friendly world in the active system that does not already contain a structure. A player purchases a unit by spending an amount of materiel equal to the materiel cost for that unit as displayed on his faction sheet. To spend materiel, the player decreases his materiel dial by the appropriate amount. Then, he places the unit on any friendly or uncontrolled area in the active system. Some units cost a forge token in addition to their materiel cost. To spend a forge token, a player takes a forge token from his play area and places it in the supply. Players can only place ground units on worlds and ships on voids. In addition to these basic restrictions, a player must adhere to command level restrictions. The maximum number of units that a player can purchase with one Deploy Order is dictated by his deploy limit. His deploy limit is equal to the unit capacity of the world in the active system where his factory is located. Unit capacity is shown as skulls on the world's banner. Each player has a command level that indicates which units and upgrades he can purchase. A player's command level is equal to the number of cities he controls. Each unit and upgrade card has a command level requirement. A player can only purchase units and upgrades with a requirement equal to or less than his command level. A player purchases a structure (city, bastion, or factory) by spending an amount of materiel equal to the materiel cost for that structure as displayed on his faction sheet. Then, he places the plastic structure on any friendly world in the active system on top of one of his structure control tokens. The token underneath each structure indicates who owns that structure. Important: A player cannot place a structure on a world that already has a structure. Gain Assets: The player gains the assets granted by each friendly world in the active system. Assets are displayed on the right corner of a world's banner. The player takes the corresponding tokens from the supply and places it in his play area. If the world provides multiple assets, the player collects all of them. Resolve Faction Ability: The player may resolve the special ability listed on his faction sheet. To resolve a Strategize Order, if the player has a unit or structure in the active system, he may look through all cards in his upgrade decks. Then, he may purchase one order upgrade and/or one combat upgrade if he meets each card's command level restrictions. After resolving this order, he places the order token on top of his event deck, which allows him to draw an event card during the Refresh Phase. To purchase an upgrade, the player must spend an amount of materiel equal to the materiel cost displayed on the upper left of the upgrade card. To spend materiel, the player decreases his materiel dial by the appropriate amount. Order Upgrades: Order upgrades increase the functionality of order tokens. After purchasing an order upgrade, the player places it in his play area next to his faction sheet. Each order upgrade corresponds to one of the four orders (Deploy, Strategize, Dominate, Advance) and provides the player with a benefit when resolving the corresponding order. Combat Upgrades: Combat upgrades are more powerful combat cards that the player shuffles into his combat deck. A player purchases combat upgrades in pairs. When a player purchases one combat upgrade card, he receives both copies of the card. When a player purchases a pair of combat cards, he must remove two copies of any other card from his combat deck and place them both into his combat upgrade deck. Then, he adds both copies of the purchased upgrade to his combat deck and shuffles the deck. A combat deck always contains two copies of five cards for a total of ten cards. Players use Advance Orders to move units and begin combats. 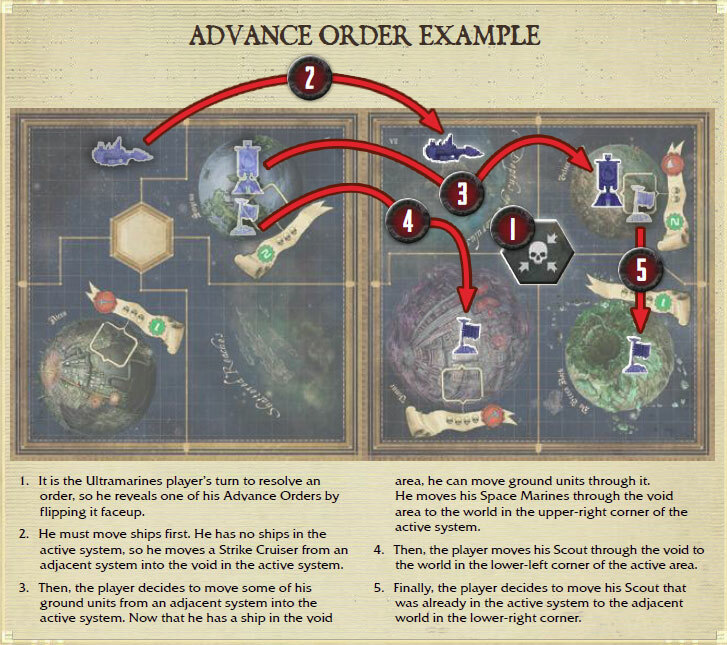 To resolve an Advance Order, a player moves units into the active system. After moving units, the player resolves a combat if there is a contested area-an area that contains both friendly and enemy units or structures. Move Ships: The active player may move his ships in the active system and one adjacent system to any voids in the active system. Move Ground Units: The active player may move his ground units in the active system and one adjacent system to any worlds in the active system. If he moved ships from an adjacent system, he cannot move ground units from a different adjacent system. Resolve Combat: The active player resolves a combat if there is a contested area. If there is not a contested area, he may resolve an orbital strike instead. Important: Units cannot move through Warp Storms, and a player can create a maximum of one contested area while resolving an Advance Order. A player may move any number of units with a mobilize order, but a maximum of five units can end their movement in each area. When moving a ship, a player can move a ship from the void it currently occupies to any void in the active system, even if the two areas are not adjacent. When moving a ground unit, a player can move a unit from the world it currently occupies to any world in the active system connected via a path. A path is a series of contiguous, non-diagonal, friendly areas. A path can consist of worlds, voids, or a mix of both. Ground units can move from one world to an adjacent world without the use of a ship. Thematically, they are using nonmilitary transport ships or other mundane forms of travel that are not represented in the game. There is no limit to the number of units that a player can move through a friendly area. Each area has a unit capacity. Voids have a unit capacity of three, and each world has a unit capacity equal to the number of skull icons presented on the world's banner. An area's unit capacity indicates the maximum number of units that can exist on an area after resolving an order. After resolving an order, including any combat triggered by that order, a player must destroy any of his units that exceed an area's unit capacity.